New developments in computer technology will be key to homes of the future. Many of our clients realize that because of the ever-changing technology market, the skill-sets necessary to implement technology are constantly changing. As a result, it is difficult for the average homeowner today to stay up to date on the latest technology for the home. Maine Total Technology can provide the support you need to take advantage of the latest technology for the home. Very soon, your home computer will control a variety of systems in your home. Currently, it is common to "surf the net", store and play music, and view digital photos and even home video on a home computer. Soon, you will do all of this, plus buy, rent, store, and watch movies, record television programs, and subscribe to online media services. This will all be done with a Home Entertainment System, consisting of a home computer, an audio/video surround sound receiver or amplifier, and a High Definition television. The home computer will become the main tool controlling all of the entertainment in your home, and more. Maine Total Technology provides the expertise to execute home technology projects, and to help manage Home Entertainment Systems. Our services allow homeowners to focus on enjoying their Home Entertainment System. In order for you to enjoy the wonders of home technology, you will need to have a reliable, stable computer controlling your Home Entertainment System. Your data will need to be protected, secure, and you will need to have a reliable disaster recovery plan in place in the event of an equipment failure. 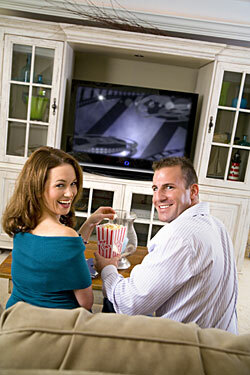 Maine Total Technology can assist you in designing, configuring, and maintaining your Home Entertainment System. Put your valuable data in the hands of professionals. More than ever, you need a home computer that's simple, intuitive, and even fun, so you can zip through tasks and devote more time to the things that matter most in your life. Maine Total Technology can provide the equipment and support you need to make this a reality. Maine Total Technology sells only the highest quality products, including software, computers, printers, networking products, cables, and supplies, at competitive prices. We "use what we sell", both at our offices and at our homes, so we'll be able to provide the product support you need. Located on Main Street in Gorham, Maine Total Technology is "on the way" to wherever you are going. We do our best to provide our customers with hassle-free sales and service. We want to be your friend in the business, and provide you with great products and services at prices comparable to the big box stores. Have a quick question, need advice, or having a problem? Call us! We are happy to assist our valued customers. Maine Total Technology has been providing reliable and timely computer and network sales, service, and support to small to medium size businesses in New England since 1990. We have always gone to great lengths to keep pace with technology and industry trends in order to provide our business customers with cost-effective and proven solutions. Now, Maine Total Technology offers the same level of sales, service, and support to residential customers. How much is your data worth? A better question might be, how important is recovering all of your digital photos if you lost them due to an equipment failure? How about all of the music or software you purchased online? A computer is a piece of equipment, and equipment can fail! Everyone will most probably "lose" data in their lifetime, and it will definitely have an impact on their life. The trick is to minimize the impact. When system failures happen, you need a friend in the business you can trust, who can help you recover. A friend that has properly prepared you for the inevitable. Let Maine Total Technology be that friend. We will assist you in selecting a DELL computer and procure it for you for the same price as the DELL website. We will then set up your new computer, make sure security software is installed and configured properly, move all of your data from your old computer to your new computer, and install up to three software titles. We will also recommend a backup strategy to protect your data. We'll get to the heart of the matter and find your PC's problem through a series of system checks and diagnostics. Once we identify the problem, we'll advise you on the best course of action to get your PC back into shape. Your computer, requires regular maintenance to keep it in good working order. This service includes a number of system tweaks that will shorten your computer's boot time, and delete unwanted files and unnecessary background processes. We will bring your system up to date with the most recent updates and ensure that your security software is properly configured to guard against security threats. From Accounting to Zoology � we will install the software you want to use. Service excludes operating system installation. Service includes repair, troubleshoot, or install of one software suite (e.g., MS Office, McAfee Internet Security, etc.) and the install of all critical updates for the software suite. We will also test the software suite for proper functionality. Install any one PC compatible internal or external hardware device onto your desktop or laptop (e.g., graphics/video card, memory, hard drives, and optical drives). Install of the latest version of Microsoft� Windows that best suits you and your computer. We will install all critical system updates. Professional, personalized training sessions where you'll learn what you want to learn on a specific topic, at your own pace � right at your own computer in the friendly confines of your home. Examples include: software, basic PC skills, digital imaging, digital video, digital music. Diagnostics to discover the cause of the problem. Troubleshoot and repair your network connection. Diagnostics to discover the cause of the issue. We'll help you get back on-line (ISP not Included). Securely share the internet, printers, and files from anywhere in your home. Enjoy fast and easy multi-tasking with a professionally installed, safe and secure wireless network. We will go to your location and will setup or troubleshoot a wired/wireless network. Enjoy fast and easy multi-tasking with a professionally installed, safe and secure wireless network. We will go to your location and setup a new wired/wireless network. Did you know that 80% of wireless networks are not secure? How secure is your network? We will go to your location, and will secure your existing wireless network. We will Migrate data from your old computer to your new computer. Data includes Internet settings documents folders, and any other folders you specify. Connect external hard drives to computer, install software & drivers, and verify drivers are functional. (Data transfer services available. Ask for details.) Set up operating system software for network system access and configure computer to routinely back up. We'll show you how to store data for back up. Using specialized software we will attempt to recover your data from a failed computer.